In the past few years, the Salt Lake art world has expanded and so have the galleries––making this evening a wonderful way to get to know Salt Lake City. The best art is usually found in the well-kept hot spots and back alleys of the community. Artopia gallery, a coffee shop, retail space and underground music venue, recently opened up at 60 Exchange Place. The new location is a product of the mass upheaval of Sugarhouse businesses. Artopia opened their doors in Sugarhouse three years ago, but the new building has a fresh and inviting vibe. The change has allowed for more of a cross-cultural experience. “I’d really like to have something in here for every kind of person,” Lee Cano, owner of Artopia, explains. Currently showing in the main level is Randall Nigonosiah, Tracy O’Brien and paintings by MASO. Artopia also carries numerous hats and hand-blown glass. From the paintings in the café to a full gallery space/concert venue in the lower level, it’s obvious they revere locally made products. My experience, be it on Gallery Stroll or any other night, is that it’s a charming place to be. I know it’s hard to get out and check out art, but what if you didn’t even have to leave your car? The Don Brady Interior Design Firm had 18-foot windows just begging to be decorated. Utah artists heard the call and the partnership lead to the Don Brady Drive Through Gallery, located at 1300 East and 2108 South between the Finnish Touch Day Spa and A Gallery. The month features, Storm’s Coming, an instillation by Elmer Presslee and Xkot Toxsik. The installation features creations and creatures from both artists in their first collaboration. 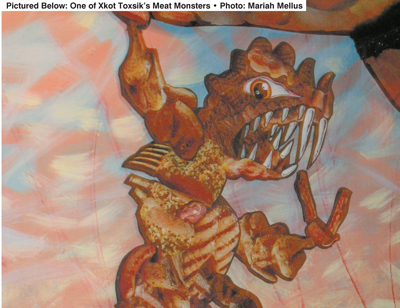 Toxsik has been creating mutant meat monsters for years, which is a perfect match to Presslee’s muscled monstrosities. Both men have similar styles and appreciation for sci-fi. “We had been in shows, hanging on the same walls and we are finally getting to work together,” says Toxsik, who is also the owner of Blitz Salon. Presslee has been working on developing this installation for a year, but other projects kept coming up. His new show in London for the Strychnine Gallery and sending art to Berlin to be on permanent display are only two examples. The Storm is a powerful, enlightening and diabolical look at what happens if you let Toxsik and Presslee play God. The best time to view the piece is after dusk until 3 a.m.
For other late night art showings, check out the Broken Record located at 1051 S. 300 East. Broken Record, formerly Todd’s Bar and Grill, has played host to many artists over the years, providing a popular alternative to Clydesdales etched on mirrors or buzzing neon beer signs. Opening February 12 and hanging until Feb. 18, fierce female artists Sarah de Azevedo, Michelle Emerson and Shauntay Ramsey will brighten up the normally dingy bar walls with their renditions or fears and fantasies. De Azevedo will have a collection titled Baby Teeth, small paintings and drawings inspired by creepy animals, bats, cats, teeth, lots of sharks and severed girls. Shauntay Ramsey’s work focuses on Teratophobia (the fear of having a deformed child), while Emerson takes it down a notch and back a step in As You Were. She describes it as “photography that is genuine, honest and sincere.” All works are originals, so if you are looking to buy, get there early. The show opens at 8 p.m. on Feb.12. Broken Record is a private club for members, 21+ only. Kayo Gallery, under the new direction of Shilo Jackson, has graciously donated their space for an evening of awareness, empowerment and healing hosted by Allison Woo on Feb. 8-9. “My vision is to inspire and empower women who have been battered or abused,” she says, “My vehicle to do so starts with the gallery show titled A Tribute to Battered Women, with [the word] ‘battered’ crossed out and replaced with ‘deserving and powerful.’” This show will feature female artists and their renderings of battered or abused women, along with powerful first-person accounts of how it feels to be in, and struggling to get out of, an abusive relationship. Show times are from 6-9 p.m. and the Kayo Gallery is located at 300 S. 177 East. On Feb. 15, Red Light Books will host Phuck Picasso by Qi Peng. Qi Peng is a self-proclaimed male feminist, which is why he felt so strongly about the sexism Pablo Picasso was known for in his personal and professional art career. In Phuck Picasso, Peng takes a closer look at what Picasso created and insinuated using the female form, and then explores how he too can use the female form: to empower rather than mold for personal and commercial gain. Using his “mash-ups” of Hustler, Penthouse, Bare Legs and High Society, will he champion women’s rights, or offend the very same group he claims to be fighting for? Only the viewer can decide. For adults’ eyes only, check out what might be the most controversial show of 2008. A lot is happening in the art world and there is so much more. Stay on the lookout, because art is all around you.